Schumann’s trios to perform at Southern Ohio Museum. Southern Ohio Museum Presents Strings and Keys, A Chamber Music Concert April 7, 2:00 pm. As part of the Sunday Classics Series, the Southern Ohio Museum presents “Strings and Keys”, a traditional chamber music concert with two ensembles performing works perfect for a spring afternoon! The first ensemble, performing Schumann’s “Piano Trio no. 1 Op. 63 in D Minor” is performed by Tianle Chen on piano, Hao Miao on violin, and Yuanxi on cello. This Schumann piece, written in 1847, is the most celebrated of Schumann’s trios. It is romantic in style, light and playful, yet a vigorous composition, with counterpoints between the piano’s bass and the violin. By the third movement, a duet between the violin and cello unfolds to the finale. The second chamber music ensemble will play E. Dohnanyi’s “Serenade Op. 10 in C Major”, performed by Seok-gi Hong on violin, Wenxin Zhao on viola, and Suzanna Lee on cello. This five movement suite was written by the Hungarian composer in 1902 during a concert tour to London and Vienna. It was first performed in Vienna in 1904. It is considered one of the composer’s finest early works; the many harmonic and thematic twists attest to the Dohnanyi’s imagination and craftsmanship. This concert is part of the collaboration between The Southern Ohio Museum and The University of Cincinnati-College Conservatory of Music, hosting faculty and competition winning students from the Classical and Jazz departments, providing concert goers with a rich experience from both well-known and emerging talent. This performance is supported, in part, by the Scioto Foundation and will be followed by a reception and refreshments, with the opportunity for audience members to speak with musicians. The concert will be held in the Hopkins Theater, and tickets are $6 for Museum Members, students and seniors, and $8 general admission, and are available at the door. The galleries will be open during the performance. 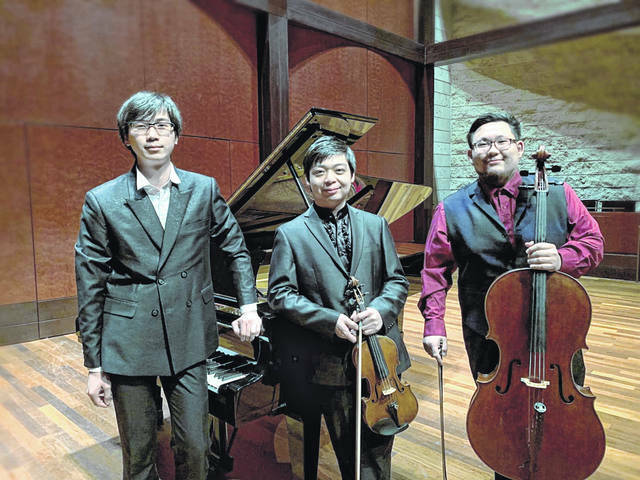 or call the Museum 740-354-5629.
https://www.portsmouth-dailytimes.com/wp-content/uploads/sites/28/2019/04/web1_Trio-.-Schumann.jpgSchumann’s trios to perform at Southern Ohio Museum.